The LC is always bringing you the rare and exotic treasures from all over the world. Our latest gemstone won’t disappoint. Australian Chrysocolla is a vibrant gemstone with a stunning blue-green hue, similar to the very popular turquoise. Continue reading to discover more about this striking stone. Chrysocolla is 100 percent natural is rich with copper. It’s actually part of a small group of copper-bearing gems. Other gemstones within this group include azurite, malachite and cuprite. This gemstone has a propensity to mix with other minerals, so pure chrysocolla is quite rare. It is these mixtures with other minerals and compounds that produce chrysocolla’s unique color combinations and swirls. This stone is almost always opaque, and when it is cut and polished, chrysocolla has a high-shine, vitreous luster. The LC sources its chrysocolla from Australia, but deposits can also be found in Chile, Israel, Mexico, Peru, Rusia and the U.S. 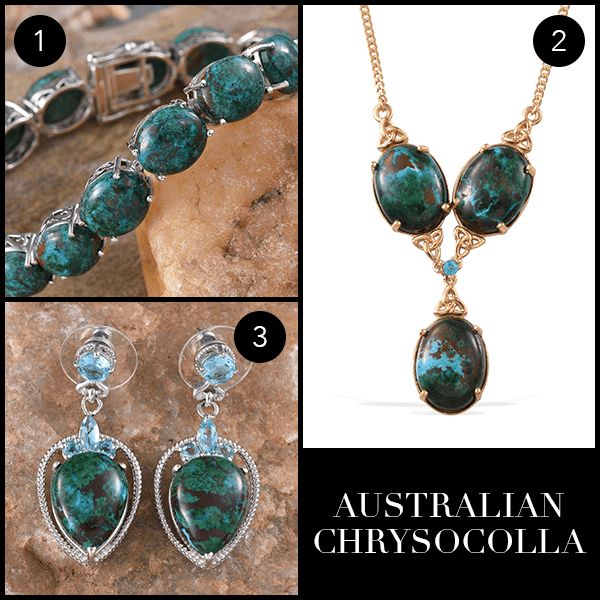 Explore the rest of our wonderful Australian Chrysocolla collection during our live show today from 12 p.m. to 11:59 p.m. CT. From stunning rings to exquisite earrings, the LC has gorgeous Australian Chrysocolla jewelry pieces to add to your own collection.